BOSTON -- Boston Bruins forward Milan Lucic isn't the type of player to duck any questions about wanting to represent Canada in the 2014 Sochi Olympics this February. "I've been doing the best I can for the team here. And I've had some personal success and we've had some team success along the way," Lucic said after the morning skate in preparation for a showdown Saturday with the Pittsburgh Penguins at TD Garden. "And I think that's the most important thing is having that team success. And I think when you have that team success, the individuals look a lot better. And so I'm just trying to play the right way and the way that they expect you to play here. And I've tried everything I can, I guess, to put forth the best audition for Team Canada." Lucic's "audition" has included a team-high 11 goals and 22 points (tied for the team lead with center David Krejci) in the Bruins' 29 games. Lucic has continued to be a physical presence with a team-high 99 hits. This season has been about more than impressing the Canada brass. From the outset, this season has been about erasing the nightmares from 2012-13. After scoring 26 goals in 2011-12, Lucic scored seven in 46 games last season. His image rehabilitation began in the Stanley Cup Playoffs, when he scored seven goals and 19 points during the Bruins' 22-game run to Game 6 of the Stanley Cup Final, where they lost to the Chicago Blackhawks. Lucic arrived at training camp, just weeks removed from attending Canada's orientation camp in Calgary, in better shape than last season. That helped him get off to a better start, even as he and Krejci adjusted to a new right wing, Jarome Iginla. A change of mindset aided Lucic's production, which has carried over from the playoffs to this season. "I think my mindset last year was focused just on scoring," said Lucic, who had a career-best 30 goals in 2010-11. "For me, it's always been when I focus just on scoring, that's when I've struggled scoring. In the playoffs last year, I just worried about just playing and trying to be a force out there on the ice. The points and the goals just kind of came with it. "That's where my mindset has been at coming into this year, and it's worked well so far, but obviously you want to stay on top of things. When you get into the scoring areas, make sure you're bearing down." From mid-November through the early portion of December, Lucic was in a stretch of eight games with two goals. But even when he's not scoring, Lucic has contributed to a solid start that's had Boston at or near the top of the Eastern Conference standings from the beginning of the season. "He's skating. He's making things happen," Bruins coach Claude Julien said. "And you know the puck may not always be friendly with him at times, but his work ethic and his compete level is there and he's helping in any other way. Even if he's not scoring, his physicality has been there. I think he's been a good player for us." Julien will serve as an assistant coach for Canada in Sochi. Bruins general manager Peter Chiarelli is part of the management team. That familiarity might aid Lucic's cause in getting on the team, regardless of the overabundance of talented players Canada has to choose from. There will always be questions about the 6-foot-3, 228-pound left shot navigating an Olympic-sized rink. The player and his coach are out to answer those doubts. "Milan is a good skater. Once he gets going in a straight line, he gets there," Julien said. "At the end of it, you're going to look at if he fits into your top 23 or 22 players and go from there. We have to evaluate everybody and see what they bring. At the same time, it's not always about brining top players, and you've heard that before. It's about bringing the best team you can and it takes a variety of different players. "[You] have to have a good power play, have to have good penalty killers. That's what you're looking for; you have to build the best team possible. When it's all said and done, you know there's going to be opinions of why isn't he on, why isn't that on? That's part of the process and you live with it. When you win, it's not an issue. When you lose, you have to face those question marks." Lucic played on a bigger rink during the Canada-Russia series when he was a teenaged Bruins prospect for the Vancouver Giants of the Western Hockey League. Prior to that, he recalled that in the British Columbia Hockey League there was a rink his team visited with a college-sized ice sheet. In all cases, he said he didn't have any problem adjusting to the roomier conditions. In general, Lucic said he believes he has proven he can handle playing at any speed. "For me, personally, I feel like it's never really been an issue. 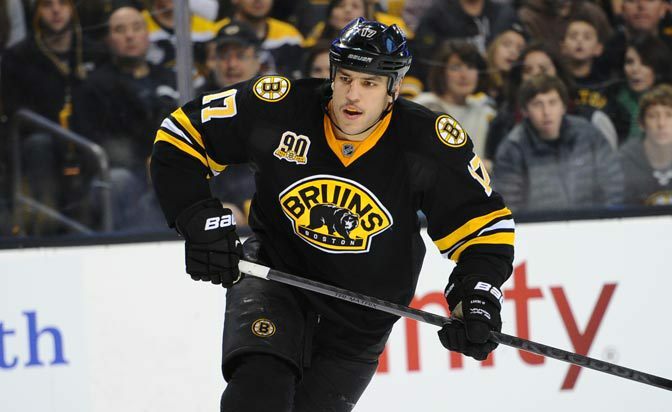 I've always been able to keep up with the pace, and keep up with the speed," Lucic said. "I've played in two Stanley Cup Finals, and you know there's no faster pace than that. And I've been able to keep up with that pace. So if it's overlooked, I guess it's an advantage for me." Maybe his surprising speed isn't as powerful a weapon as his size, strength and shot. But there's no doubt Lucic wants to do it all for Canada. If he keeps up the pace he has shown so far this season, it could turn his aspirations into a roster spot.